Danny O’Brian’s presentation on fame and the internet was fantastic and funny. It touched many interesting aspects of fame, privacy and relationship grooming. I would have liked to hear more on micro fame and maybe exploring the advantages of internet extended persona. As a side note I loved his use of quicksilver as substitute for PowerPoint. Ted Nelson’s presentation was both a highlight and a bit of a let down. He has been a hero of mine since I saw BBC’s Hyperland in the early 90s but here there were two problems in his presentation. 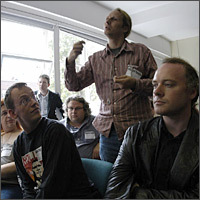 He did not show a compelling user experience for his translit project which made it very difficult to grasp and frankly he sounded biter about the web. Paul Mutton Social network graphs were super cool. Sebastien Noel from Space Hijackers presented their next project MMS Charles Clarke a project to track Charles Clark the british interior ministers every move through a network of volunteers with camera phones. There was a session about starting some kind of UK based Electronic Frontier Foundation to fight for digital rights. This is seems rather odd to me as the industry lobby now operate on a european level. Even a european organization seems strange as the battle ground is increasingly global and with things like the mickey mouse copyright extension act starting it’s life in Europe and then the Americans harmonizing on a European decisions I think one global organization with local chapters makes much more sense. I think EFF is the bast placed to step up to the plate. I'm off to London and Open Tech 2005. There seems to be lots of interesting speakers but not enough time alloted to them. Christian pointed me to this uber cool folding window interface metaphor, so simple one can't help to wonder why nobody implemented it yet. In a way it does similar stuff to Apple's expose but whereas expose is good when you don't know where your target window is located this folding window interface is ideally suited to when the target screen is right under your current one. Well worth the read if your company lives on creativity and which company does not these days. Although I have used and loved Quicksilver for quite some time it’s only these last days that I have really groked it. I got the revelation when looking at a video of a quicksilver and backpack integration. When Tiger came out there was some speculation if quicksilver would survive spotlight, someone wrote that spotlight is about nouns whereas quicksilver is about verbs. Spotlight just returns things whereas quicksilver allows you to do things with things. So even though I used the verb part of quicksilver it was always like a foreigner that didn’t quite master the grammar. Now finally I get it. So if you are a mac user and you have not given Quicksilver a real chance. I highly recommend that you spend some time exploring it. 43folders has a good starting point. just remember that a little like photoshop, quicksilver is one of those programs you can only really feel the full value once you grok it ;-). Xavier just showed me Yubnub a kind of command line for the web, It allows you to do all kinds of searches and commands from a single field. AJAX is the hot new web framework that makes web application act more dynamic and responsive. Essentially what it does is allow a web page to update portions of itself by communicating and parsing little xml snippets back and forth with a webserver. Gmail is a good example of an AJAX application. One of my favorite radio host Ira Flatow of science friday interviews Tom Friedman, one of my favorite columnists. They talk all kinds of topics surrounding Friedman's book "The World is Flat: A Brief History of the Twenty-First Century".